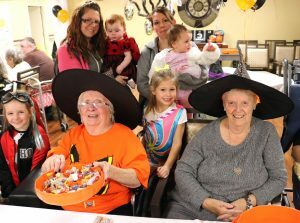 OSWEGO, NY – Morningstar Residential Care Center opened its doors for an evening of Halloween fun as residents welcomed dozens of trick or treaters. In front from left are Bella Austin, Peg Williams, Ellie Mae Austin, and Claire Anthony. Standing from left are Cristina Austin with Cheyanne Austin, and Kristie Austin with Sadie Austin.